The genetic code is the set of instructions cells use to translate information from genetic material (DNA or mRNA) into amino acids. In turn, amino acids are strung together and modified to build proteins. The genetic code is sometimes called the universal code because it is used by nearly all living organisms on Earth. There are 64 codons in the mRNA code, each consisting of three nucleotides. Most of the codons specify an amino acid. However, there is one “start” codon that encodes methionine and marks a protein’s beginning and three “stop” codons than mark the end of a protein. The nucleotides are abbreviated by the letters A, U, G, and C for adenine, uracil, guanine, and cytosine. Organisms that translate proteins directly from DNA use T for thymine rather than U for uracil. Codons are read from the 5′ terminal of mRNA to the 3′ end. Proteins are built from the N-terminus at methionine to the C-terminus. This table summarizes the genetic code, which you may need to memorize for a genetics or biochemistry class. You can right-click the table to download its image file or print the PDF to use as a study guide. 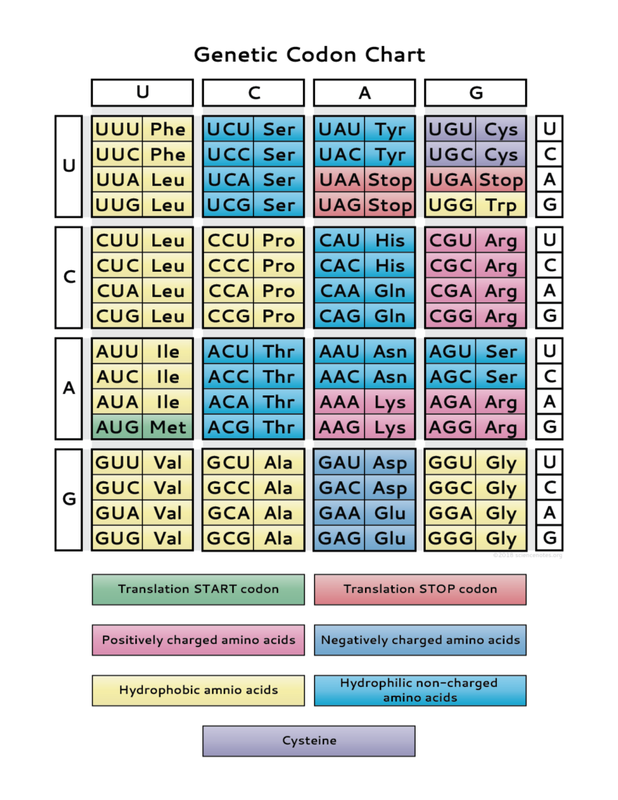 Useful study sheet showing the genetic code chart and color coded to show the amino acids, their charge, and start/stop codons. Read the nucleotides of the genetic code from left to right. The amino acids are indicated using their three letter abbreviations. If you would like to study the amino acids, a printable amino acid study sheet is available. There’s more than one codon for most amino acids. The exceptions are methionine (Met) and tryptophan (Trp). The chart is color-coded, to make it easier to keep track of the positive, negative, hydrophobic, and hydrophilic amino acids.